Researchers from Polytechnic Institute of New York University (NYU-Poly) developed a bio-inspired robotic fish to mimic the tail propulsion of a swimming fish and conducted experiments at varying tail beat frequencies and flow speeds. They found that when the robot fish was placed with a school of golden shiners and simulated the familiar tail movement of a leader fish, the school assumed the behavior patterns they exhibit in the wild. Probing the largely unexplored question of what characteristics make a leader among schooling fish, researchers have discovered that by mimicking nature, a robotic fish can transform into a leader of live ones. Through a series of experiments, researchers from Polytechnic Institute of New York University (NYU-Poly) aimed to increase understanding of collective animal behavior, including learning how robots might someday steer fish away from environmental disasters. 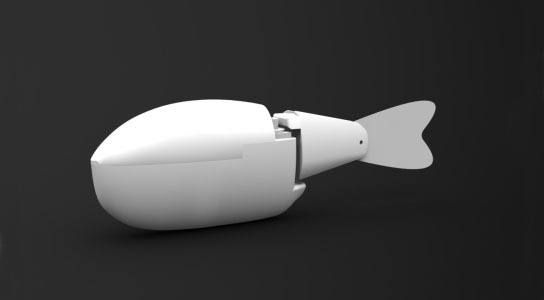 Nature is a growing source of inspiration for engineers, and the researchers were intrigued to find that their biomimetic robotic fish could not only infiltrate and be accepted by the swimmers, but actually assume a leadership role. In a paper published online in the Journal of the Royal Society Interface, Stefano Marras, at the time a postdoctoral fellow in mechanical engineering at NYU-Poly and currently a researcher at Italy’s Institute for the Marine and Coastal Environment-National Research Council, and Maurizio Porfiri, NYU-Poly associate professor of mechanical engineering, found conditions that induced golden shiners to follow in the wake of the biomimetic robot fish, taking advantage of the energy savings generated by the robot. The researchers designed their bio-inspired robotic fish to mimic the tail propulsion of a swimming fish, and conducted experiments at varying tail beat frequencies and flow speeds. In nature, fish positioned at the front of a school beat their tails with greater frequency, creating a wake in which their followers gather. The followers display a notably slower frequency of tail movement, leading researchers to believe that the followers are enjoying a hydrodynamic advantage from the leaders’ efforts. In an attempt to create a robotic leader, Marras and Porfiri placed their robot in a water tunnel with a golden shiner school. First, they allowed the robot to remain still, and unsurprisingly, the “dummy” fish attracted little attention. When the robot simulated the familiar tail movement of a leader fish, however, members of the school assumed the behavior patterns they exhibit in the wild, slowing their tails and following the robotic leader. The researchers posit that robotic leaders could help lead fish and other wildlife that behave collectively — including birds — away from toxic situations such as oil or chemical spills or human-made dangers such as dams. Other experimenters have found success in prompting wildlife to move using non-living attractants, but the researchers believe this is the first time that anyone has used biomimetics to such effect. Marras and Porfiri conducted their experiments with support from the National Science Foundation. 2 Comments on "Researchers Use Robot Fish to Lead Golden Shiner School"
So, you drop a robo-tuna in a shoal and lead the entire batch up the factory ship’s ramp and into the freezer. No dolphin kill, no loss of sea turtles . . . very neat! Lead fish away from environmental disasters, indeed. Puh-leeze!